Oh dear. Camila’s umbilical cord is still in that pink Tupperware box in the freezer. 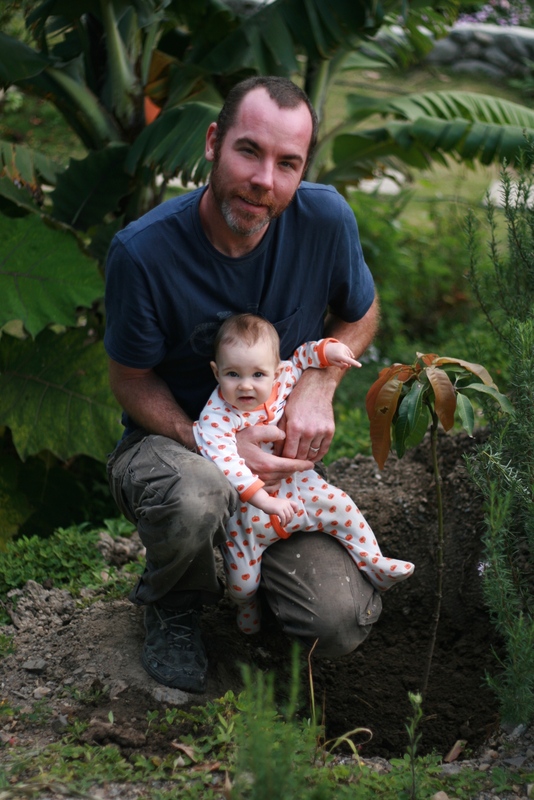 The idea was to have it planted under a mango tree right after Camila’s birth. But finding the right mango plant has proved to be rather challenging. There are so many different varieties of mangoes and I had finally identified the one we really liked: it’s called Mango Edward. Nice big sunset coloured fruits with a thin skin, a velvety texture and a sweet juicy flavour. All the ones we have planted under the promise they’d be Edward have now started producing fruits. And they are not Edward. They are Tomy. (*grunt). Tomy have a green and red thicker skin and are more stringy and fibery and their flavour is not as sensuous as the Edwards. Ecuadorian tend to be very approximate and imprecise and are very bad liars. They sell you whatever they have under the semblance of what they understand you are seeking. When I have passionately been describing to the plant sellers what fruit I was after they would just point at what plants they have, passionately convincing me that those are exactly what they will be producing. And then if I tricked them and said ‘and what about the other ones, the ones with the thicker skin?’ they would point at the same plants. Then you get those sellers who just don’t listen. I’d ask the lady: ‘Is this a Mango Edward or a Mango Tomy?’ Answer: ‘yes’. Erm…Nope woman! Is either one or the other, not ‘yes’. (*grunt). And once again I would walk away frustrated. So this Mango palaver went on until now, ten months on when we finally found a mango plant in a nursery that was actually labelled as a Mango Edward. Boom. Got it and decided to plant it on the approaching Mother’s day, to celebrate Mama Biba for the first time. Along with Camila’s umbilical cord to celebrate her life and a sprinkle of Epsom salts in lieu of fairy dust. Meanwhile, a mile down the road from us, our friend Ashley was in full labour and delivered a precious baby girl that same afternoon. How nice is it to become a mother on mother’s day? 11 May	This entry was published on May 11, 2015 at 1:17 pm and is filed under Ecuadorian culture, gardening, Mamahood, Uncategorized. Bookmark the permalink. Follow any comments here with the RSS feed for this post. great news, congratulations. We MUST visit each others soon then! !